Deep Hole Specialists (“DHS”), is a specialized contract machining business that provides metalworking services including precision deep hole drilling such as gun drilling, trepanning, and spade drilling. 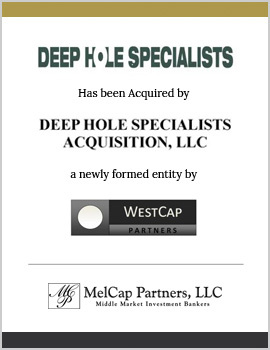 MelCap Partners acted as the sell-side advisor to the shareholders of DHS, Midwest Tooling Group. DHS was successfully sold to WestCap Partners, LLC, a local private investment group with experience in metal products.